96 students enrolled to put their thoughts on paper! 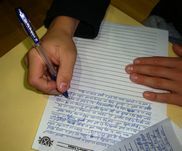 On Wednesday 8th June, 96 students took part in the St. Andrew's Society of the River Place annual writing competition. Each student contributed with 20 pesos to take part, money which is destined to support various charities in the city. Impressively, several students offered to make a donation to the fund, even if they were not able to take part on the day of the competition. St Andrew's School has a long successful record of participating in this event, which encourages students around the city to develop their writing skills and respond to a range of writing prompts, including short stories, poetry, and journalism. Many thanks to all the staff who supported this event, both in promoting it, and with the organisation on the day, which enabled it to be so successful.